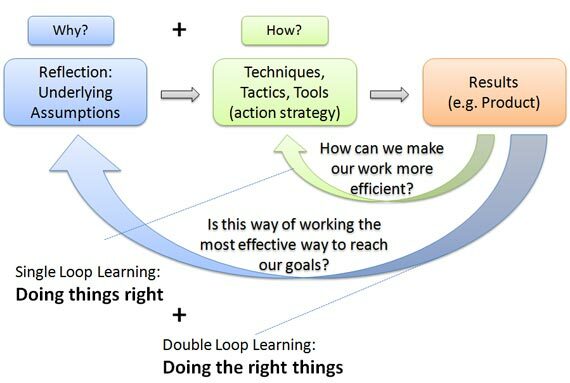 Chris Argyris coined the terms "Double Loop Learning" and "Single Loop Learning. Single loop learning has often been compared to a thermostat in that it makes a "decision" to either turn on or off. Double loop learning is like a thermostat that asks "why" — Is this a good time to switch settings? Are there people in here? Are they in bed? Are they dressed for a colder setting? — thus it orientates itself to the present environment in order to make the wisest decision. Single Loop learning as the most common style of learning is just problem solving – improving the system as it exists. This type of learning solves problems but ignores the question of why the problem arose in the first place. 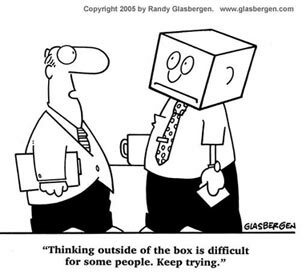 Double-Loop learning involves questioning the underlying assumptions behind techniques, goals and values. Double loop learning uses feedback from past actions to question assumptions underlying current views. A person who is double loop learning is asking a series of "whys" (similar to Sakichi Toyoda’s technique he called the Five Whys: When confronted with a problem you ask "why" five times. By the time the fifth why is answered, you should be at the root cause of the problem). Argyris & Schon’s model of single- and double-loop learning is interesting, but what’s even more interesting (IMHO) is their view that double-loop learning will not occur if the topics are embarrassing or threatening, because most humans respond to these conditions with defensive reasoning. They say that people will by-pass feelings of embarrassment or threat, and cover-up their by-pass, leading to situations where people feel unable to “discuss the undiscussable”. So, in situations where challenging the assumptions behind an action produces embarrassment or threat, people apply defensive reasoning and simply asking ‘Why’ five times won’t lead to double loop learning.